Bitwig Studio 2 is the first major upgrade to this relatively new digital audio workstation package since its initial release around three years ago. The first version underwent a lot of incremental improvements since I reviewed it in June 2014, most of which were covered by Robin Bigwood in his March 2016 review of v1.35. So what have Bitwig introduced in version 2 to justify bumping up the version number, and charging for the privilege? The answer, in a nutshell, is that although the core recording, playing, editing and mixing functionality of Bitwig is largely unchanged, its instruments and effects have been given a major structural overhaul. 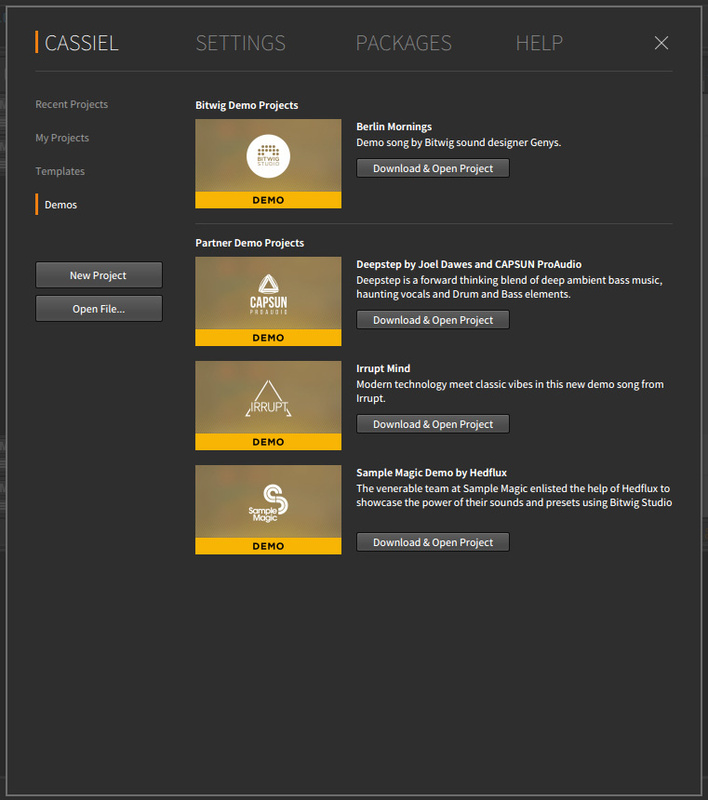 The new Dashboard serves as the starting point for settings, projects and help.Rather than repeating the above-mentioned revews’ in-depth descriptions of how the program works, I’ll assume a working knowledge of Bitwig in writing this one. In particular, I’m not going to talk about Bitwig’s clip editing features, which haven’t noticeably changed apart from the layout of some buttons and controls, nor its clip launching and arrangement views. Instead I’ll look at what makes Bitwig 2 different to Bitwig 1, starting with the improvements to Bitwig’s overall user interface. The most obvious change in Bitwig’s user interface is the addition of something called the Dashboard. This can be thought of as a glorified preference pane which also incorporates file and package management. It pops up if you launch the application directly, rather than by double-clicking a project file, and can be accessed by clicking the ‘wig’ icon at the very top of the application window. The leftmost tab, labelled according to your Bitwig username, accesses projects (including downloadable demos); next along is Settings, with subsidiary tabs for preferences relating to user interface, audio, controllers, synchronisation, plug-in management and so on. Next along is the Packages tab, which is sorted into collections according to the source from which they originate. Finally, the Help tab links to tutorials and documentation. The Dashboard removes the need for Preferences, Options and Help options in the main menu system, thus allowing the menus themselves to be simplified. Bitwig 2 has only four top-level menus — File, Play, Add and Edit — though a fifth menu can appear in various editing states depending on context. The fifth menu appears whenever the currently selected object in the project offers specific editing options. Tracks get a Track menu with menu items for actions involving activation, grouping, display and navigation. Devices get a Device menu for preset management, the arrangement view has a Time menu for editing within the timeline, and so on. These contextual menus sometimes also offer items that can be pinned to the menu bar. 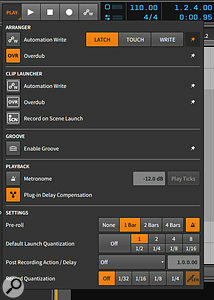 Bitwig’s linear arrangement view has received a couple of worthwhile improvements. Firstly, tracks can be resized vertically, allowing waveforms (including those in the clip launcher) to be seen more clearly — in Bitwig 1, only automation lanes could be resized — and at a certain height, the waveform view switches from mono to stereo. Secondly, clips in the arrangement timeline can now be faded. Fades in and out are supported, as well as crossfades between overlapped adjacent clips. The crossfade curve’s shape can also be altered with a quick click and drag. Arrangement clips can now be faded in, faded out, or crossfaded.Control of how instrument and effect parameters change over time is a fundamental aspect of electronic music production, and yet to date, DAWs have generally only addressed part of this process. Parameter control by automation emulates the automation control on top-end mixing desks, so when DAWs took on the task of mixing it made perfect sense for them to provide automation as well. However, another kind of parameter control, more traditionally associated with instrument programming, is mostly absent in DAWs. The ability to modulate parameters using LFOs, envelopes and so on has been regarded as part of the voice architecture of an individual synth or effect, and generally invisible to the DAW itself (except when modulation parameters can themselves be automated). The downside to this approach is that, unless your instrument is modular in some sense, you’re stuck with whatever modulation features it provides, and these can’t be integrated or shared with DAW parameters in a mix. Although there are techniques to get modulation-like control at the mixing level, such as automation curves held within looped clips, there hasn’t been a clean system to work with modulation directly in a DAW until now. 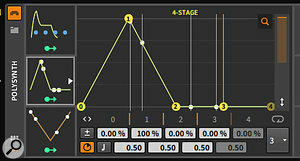 Bitwig Studio 2 embraces powerful synthesizer-style modulation as a first-class citizen. The Polysynth from Bitwig Studio 1, with its LFOs locked in place. Polysynth rebooted in Bitwig Studio 2, with generic modulators. In Bitwig Studio 2, modulators built into devices have largely been done away with. Instead, any device can contain modulators, including ‘container’ devices such as instrument layers and drum machines, and there’s a large, varied modulator library that can be used almost everywhere. If we take a Polysynth project from Bitwig 1 and open it in Bitwig 2, we get a Polysynth device which sounds and feels like the original, but looks slightly different. In particular, while the envelopes are largely unchanged and the filter cutoff is still being modulated, the one active LFO now appears in a square box to the left. But this isn’t just a cosmetic rearrangement: the LFOs have been completely removed from Polysynth and their role undertaken by a universal modulation system. Let’s take a step back. Every Bitwig device (and every VST plug-in) has slots for modulators. Clicking the small modulation icon at the bottom of a device’s title bar opens a column of three modulator slots. Clicking the plus symbol in the middle of any of the slots brings up a pop-up browser, letting you choose from the 25 different modulators listed in the box. While it might appear that there’s a limit of three modulators per device, the slot area actually grows on demand: fill the first three slots, and three more empty ones appear to the right. An occupied slot appears as a square containing a graphic denoting the modulator. These graphics are often animated, showing, for example, a modulator’s current output as an oscilloscope trace, or a moving point along an envelope curve, or a crossfade position. (Cosmetically, the animated graphics are very reminiscent of Future Audio Workshop’s Circle synthesizer.) All modulator panels contain at least one arrow icon: click this to turn on a patching mode to attach the modulator to one or more destination controls, setting the modulation amount for each one. A modulator might offer multiple sources: Vector-4 and Vector-8, for example, map a position in an X/Y grid into a number of different modulation levels according to their closeness to points around the grid. Like the fixed modulation sources in Bitwig 1’s devices, these modulators can only affect parameters in their own device, or plug-ins enclosed within it. But since containers can have modulators, it’s possible to affect a collection of devices all at once by using modulators attached to the containers themselves. 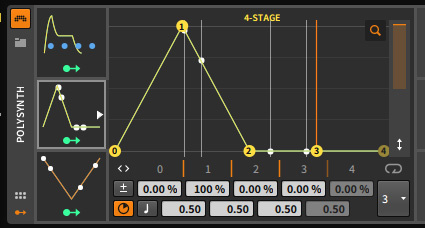 And since modulators can be applied to third-party VST plug-ins as well as Bitwig’s own devices, it becomes possible to, for example, apply a step sequence to a parameter an a plug-in that doesn’t have a step sequencer of its own. And in true modular fashion, modulators in a device can modulate one another. For example, to get a looped gate effect, you can apply an LFO to a button, with the modulation amount determining the duty cycle; the button output will then switch between off and on states as a modulation source. I do have one minor gripe about the way modulation works with VST plug-ins, though. 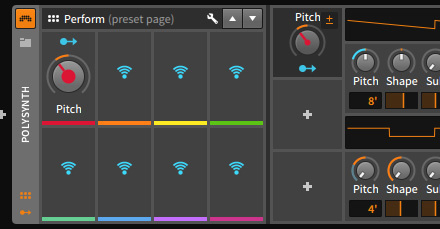 In some other DAWs, you can quickly assemble a list of ‘favourite’ parameters by picking from a plug-in’s own control panel, but that’s not possible here; instead, to access them you’ll need to scroll through them as a list, although the last parameter accessed is given its own on-screen slot. 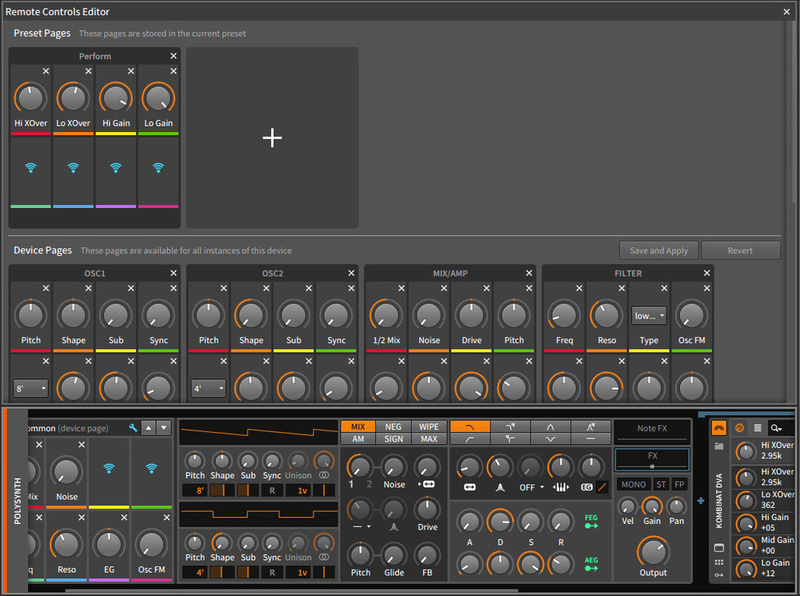 Modulators can’t be directly linked into Bitwig’s mixer, but they can be attached to utility devices to control things like level and pan, and they can be also attached to audio effects in return tracks. Even so, I can see how modulator control of (say) send and return mixer levels might be useful — perhaps this will arrive in an update. Some of the modulators respond to MIDI events: for example, envelopes are generally triggered by notes, and LFOs can be reset on note activity as well. MIDI-controlled modulators work on effects devices, even if the effects come after the instruments in a device chain: one quirk of Bitwig’s devices is that MIDI events pass all the way down a chain, even through instruments which are responding to them (this applies to VST plug-ins which don’t generate their own MIDI, too). This brings us neatly to the issue of polyphony. Many MIDI-triggered modulators can be configured to be either monophonic or polyphonic when responding to notes for Bitwig instruments. The mode is indicated by colour: blue means mono, green means poly. In polyphonic (‘per voice’) mode, the animated graphic in the modulator’s slot often attempts to show the effect on all of the device’s voices. Two envelopes, one LFO, and four active voices.In the screenshot, you can see a Polysynth modulated by two envelopes (an ADSR and a 4-Stage) and one LFO; the 4-Stage’s parameter panel is open. Each dot denotes the progress or level of a voice’s modulation through the system. Different modulators appear to have distinct behaviours when they’re in monophonic mode and triggered by overlapping notes: the 4-Stage envelope retriggers, but the ADSR stays open while any notes are active. Obviously, polyphony doesn’t make any sense for effects, so modulators there are strictly monophonic. Polyphonic modulation is also unavailable for third-party instruments, though Bitwig 2 now supports the VST3 and VST Expression standards, so you do at least get to work with per-note expression information in your clips. In practice, I found the modulation system to be strangely addictive. A few seconds checking a technical detail for this review could turn into an hour of experimentation and exploration, and I feel I’m starting to sense what it’s like to own a Eurorack system (at a fraction of the price). The different modulators on offer suggest that Bitwig’s engineers have popped down the road to the Schneiders Laden modular store in Berlin, taken all the best ideas and attempted to implement many of them in software. Alongside various LFOs and envelopes, including the loopable 4-Stage, there’s a step sequencer, an expression input (velocity and pressure), some maths functions, a random generator, two vector mixers, a modulation mixer, a four-output crossfader, and many more. And since the modulators can modulate one another, the combinations are almost endless — though some kind of smoothing function would be a welcome addition. 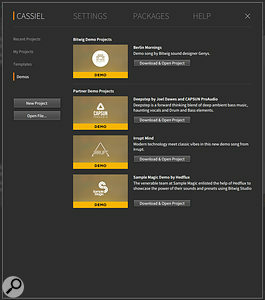 Bitwig Studio 2 comes with a number of new devices, while existing ones have been improved. There are no new instruments apart from the CV output, which I’ll come to shortly, but Polysynth has received some attention, with new filter modes and unison control. 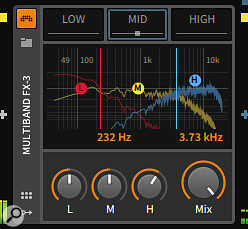 Like all Bitwig devices, it also benefits from the new modulation system. In the audio realm, there’s now a phaser (a curious omission from Bitwig 1), a pitch-shifter, a powerful ring modulator and a couple of utility effects: a dual pan control for dealing with stereo channels, and a DC offset control which seems aimed at controlling modular hardware. And, finally, there’s a spectrum analyser. The ring modulator in particular responds well to the modulation system: applying a step sequencer results in the kind of bizarre rhythmic tones that I used to coax out of early digital synth filters. A graphical display of gain, crossover and output frequencies.Finally, there’s a collection of new devices for talking to hardware, using MIDI or CV/gate. There’s now support for transmitting MIDI controller messages, program changes or song select, and MIDI Timecode can also be output. Changing programs using automation worked fine in my Korg Wavestation VST, and there’s bank select support too. A new ‘CV instrument’ turns notes into CV and gate signals, while a simple ‘CV out’ device puts out a specified control voltage (which can, of course, be automated or modulated). Finally, many existing devices have been given a facelift, with added spectral graphic displays. 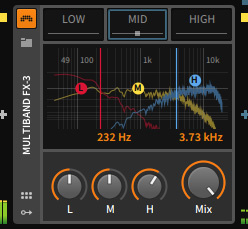 For example, the three-way multiband FX device looked pretty bare in Bitwig 1 but has been spruced up nicely in Bitwig 2: the gain and crossover points between the bands can be dragged graphically over the spectral display, which shows the dynamic output of all three plugged-in effects. Bitwig Studio 2 is an update which, at heart, represents a clean-up of the existing program rather than any kind of major redesign, with the focus on two areas: user interface navigation and modulation. 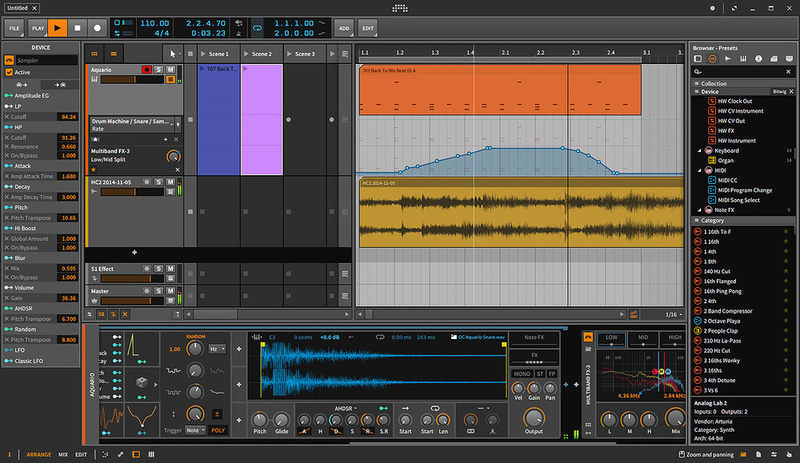 The improved user interface, although slightly unusual, is clear, logical and streamlined, making Bitwig 2 much easier to work with than Bitwig 1. The modulation system, though, is (to use a cliché) a game-changer, adding an expressive power boost both to Bitwig’s own devices and third-party plug-ins. The modulation system really makes Bitwig Studio 2 feel less like a production tool and more like a modular synthesizer in its own right, and if Bitwig’s development keeps progressing in this direction I’ll be very happy. Check out the SOS Tutorial video course on Bitwig: Exploring CVs and MIDI. Every device in Bitwig Studio 1 had a macro pane. This consisted of eight knobs which could each be mapped to one or more parameters in the device, with an arbitrary amount of positive or negative value scaling. This macro pane was also designed to be MIDI-controlled: by attaching a generic controller with eight knobs or faders, the knobs in the macro pane could quickly be mapped as a group. 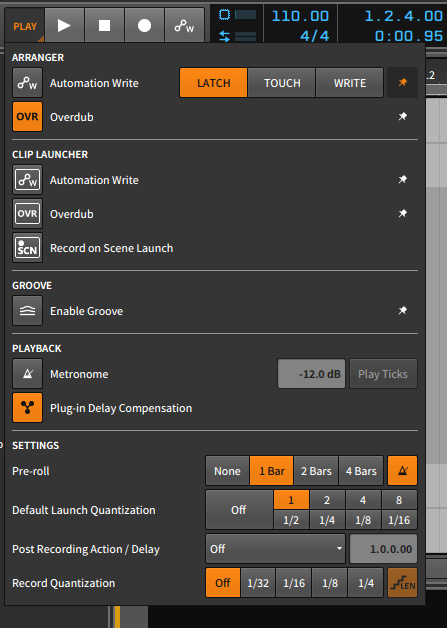 However, this mapping had the potential to be confused with an additional feature: devices might have separate parameter pages for oscillators, filters or whatever, and certain hardware controllers known to Bitwig (ie. with driver scripts installed) could also navigate back and forth between these pages. The Filter Remote Controls page for the Polysynth. In the screenshot the Polysynth is shown with the Remote Control page for its filter — note the menu control for Filter Type, which has eight discrete values. The page contents aren’t completely regimented: in this case, Oscillator FM is included, while Filter Frequency is actually included in more than one page. The knobs here are colour-coded because I have a generic MIDI controller attached; the rainbow colours are to remind me of the parameter order across the controller. 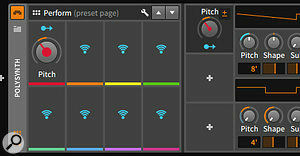 The up and down icons at the top of the panel serve to navigate between pages, but depending on the type of MIDI controller, there may also be mappings to navigate back and forth between Remote Control pages. On my Ableton Push 2 with a third-party controller script, the navigation buttons provide this function. You can add new control pages or (at your peril) modify the built-in ones.Clicking the spanner icon brings up the Remote Controls Editor for the device, where pages can be added and modified. There are default pages for each device type, which can be edited or deleted, though doing so strikes me as a little dangerous. Alternatively, new pages can be added, and live within the current device instance or preset only. In this case I’ve added a new page with four knobs mapped to parameters in a VST effect which I’ve dropped into Polysynth’s effect slot. The mapping process is similar to modulation mapping: click an empty panel in the page, and when it starts flashing, click the control you want to map. And when a custom preset-specific Remote Control page is visible, MIDI mappings take effect just as for the built-in device-specific pages. So far, so good, but we’re still missing something. How do we get the full effect of the old macro knobs, where we can set the range and direction of the parameter control? And how do we map to multiple parameters at once? The answer is the modulation system. While the mapping of a Remote Control knob to a parameter cannot be scaled, it’s possible to map a knob to a ‘Macro’ modulation control, which can then be attached to multiple parameters with different scaling amounts. Using a Macro modulator to scale a Remote Control knob and control several parameters at once.In the screenshot, I’ve added a Macro in one of Polysynth’s modulation slots, used its modulation to alter the pitch of the two oscillators in different directions, and then mapped to the Macro modulator itself from the Remote Controls page. You’ll notice that a little modulation arrow icon has appeared above the knob: this indicates that the knob is mapped to a modulation macro, which can itself be mapped to one or more parameters. This icon can be clicked to add further targets for the Macro modulator. This procedure seems a little bit convoluted — I tend to want to map a macro knob and scale it at the same time — but makes perfect sense in principle, and it has an appealing consistency to it. Powerful new modulation system across all devices. Several new devices, including MIDI and CV/gate controls. Graphical spectrum displays added to several devices. General streamlining of user interface. Scaling of device remote controls is a little more involved than it was in v1. No quick access to VST parameters. Modulation system doesn’t (yet) extend to the mixer. 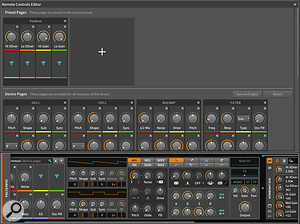 Bitwig Studio 2 incorporates well thought-out user-interface improvements and a new, powerful modulation architecture. €379; upgrade from Bitwig Studio 1 €159. Prices include VAT. $399; upgrade from Bitwig Studio 1 $169. Apple MacBook Pro with 2.5GHz Intel Core i7 CPU and 16GB RAM, running Mac OS 10.12.3.